Fitness HTML landing page is fully Responsive, Retina-ready HTML Template design for Gym, Fitness Landing Page Template, Cross fit Boxes, Yoga & Personal Trainer, Sports Clubs & Health Websites and any other sports businesses. This landing page is also suitable for aerobic, boxing, CrossFit, karate, dancing etc. It is designed with Unique and clean & modern Look. The FREE Google Fonts are used giving good look the layout. The design also includes with Schedule Time Table, promotion banner etc. 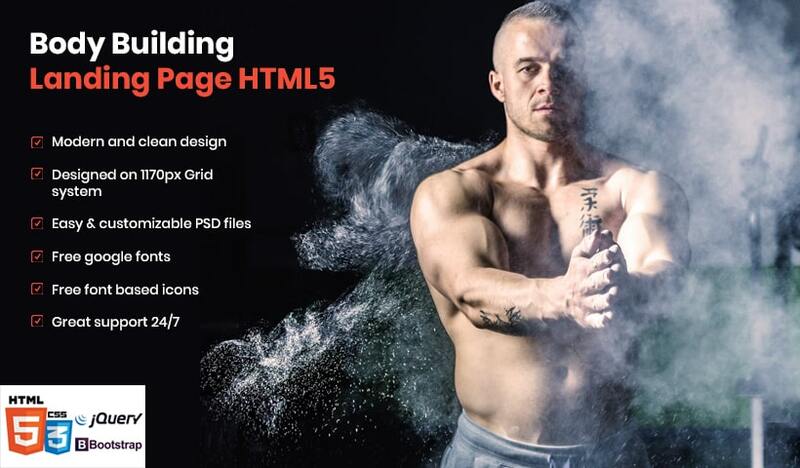 Fitness HTML landing page is fully ResponRetina-ready ready HTML Template design for Gym, Fitness Centers, Cross fit Boxes, Yoga & Personal Trainer, Sports Clubs & Health Websites and any other sports businesses. This landing page is also suitable for aerobic, boxing, crossfit, karate, dancing etc. It is designed with Unique and clean & modern Look. The FREE Google Fonts are uses giving good look the layout. The design also includes with Schedule Time Table, promotion banner for fitness club and gym etc. I’ve used this themes for my startup company. It its a great themes i ever use!